I am thrilled to be posting over here at Mad about Macarons, especially on this, my “fête” 😉 Well, I mean, EVERY Tuesday is my “fête” but today is extra special. So I thought I would whip up a little something to celebrate. Something that, you know, uses up the many many egg yolks that making macarons tends to leave me with. I mean, there’s only so much custard and ice cream you can make, right? I recently made Meyer lemon macarons filled with a blackberry jam and Meyer lemon curd which, in itself, is a great way to use up the yolks – fill the macs with them! But as I was making that lemon curd, I wondered how well another type of curd would do. Like, raspberry curd. We have a lot of raspberries in our freezer that I froze in the summer begging to be used so I figured I would give it a shot. Once I had the curd figured out, I needed a vessel for it – and not macarons! Not everyone is as “Mad about Macarons” as Jill and I! 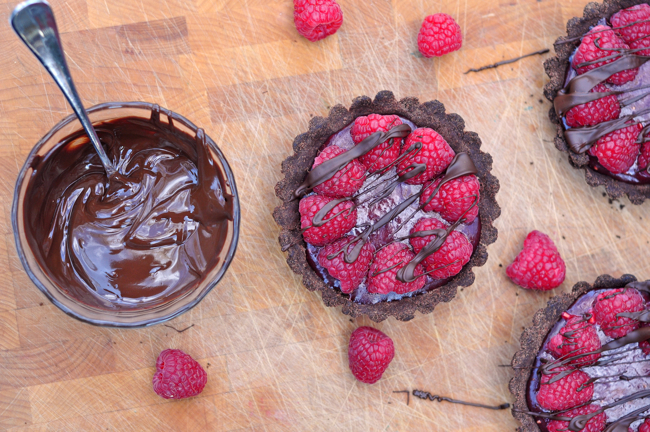 For me, raspberry is a match made in heaven for dark chocolate so I came up with the idea of a chocolate tart shell filled with raspberry curd and topped with fresh raspberries and a drizzle of melted dark chocolate. I can’t totally take all the credit for this idea – we used to have a bakery called “The Queen of Tarts” at the end of our street (dangerous!) which sold the dearest little individual-sized tarts and they used to feature all manner of fillings. I was a huge fan of their chocolate tart shells so was pleased to figure out one that closely resembled the ones which sadly only exist in my memory now…. The chocolate tart dough is taken from Dorie Greenspan’s Around My French Table (pp 500-501). As I am cooking and baking my way through this book, I knew it would be a sure bet. If you don’t own this book (why not?) it’s a basic sweet tart dough recipe where you substitute half the powdered sugar for cocoa powder. Her recipe makes one large 9″ tart shell, I halved the recipe to make four individual 4″ tarts. The curd was a little bit of experimentation but I like the way this one came out in the end. Mix egg yolks, sugar and raspberry purée in heavy saucepan with a wire whisk until well blended and smooth. Continue to whisk as you cook over medium heat for about 10 minutes, until the curd is thick and will coat the back of a wooden spoon. Remove saucepan from the heat and whisk the butter in, one piece at a time. Once all the butter is combined in the curd, transfer the mixture to another bowl. Cover the mix with plastic wrap, making sure the wrap touches the surface of the curd and cool to room temperature. * for the raspberry purée, I blend fresh or defrosted frozen raspberries with an immersion (stick) blender then pass the mix through a metal sieve to remove the seeds. Once the curd is at room temperature, you’ll fill the tart shells and place them in the fridge, covering them loosely with plastic wrap and refrigerating overnight. 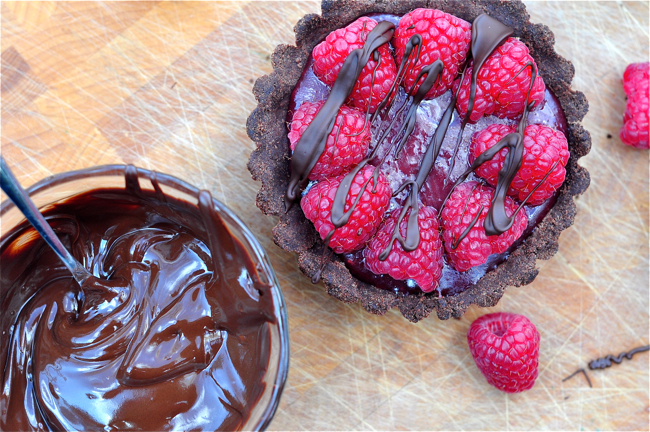 The following day, you can decorate the tarts with fresh raspberries and drizzles of melted dark chocolate. The result? A dessert that’s not too sweet which means you can drizzle as much chocolate on top of the tarts as you like. 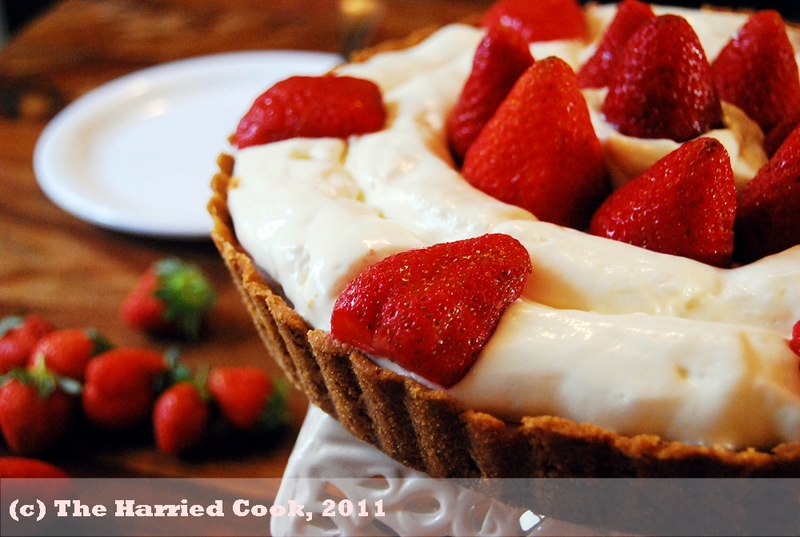 The curd is a different flavour from jam – more tart, less sweet which works in a rich dessert like this! I love that not only the filling but also the tart shell used up my always-lurking-in-my-fridge-yolks – it’s a macaron maker’s dream dessert! Mardi is a full-time French teacher at the elementary-school level in Toronto. She blogs at eat. live. travel. write. where she documents her culinary adventures (more than macarons, though sometimes you wouldn’t know it) near and far. 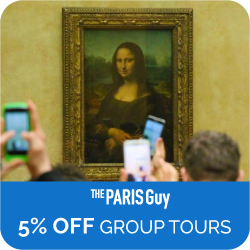 She’s a serious Francophile who spends as much time in Paris as she can. This summer, she’ll be there again, organising a foodie trip in partnership with Le Dolci Studio (Toronto) – where she teaches macaron classes – and La Cuisine Paris. Check out all the delicious details here. Thank you so much, Mardi, for guest posting today and for sharing your yolky raspberry curd with us. These chocolatey tarts look absolutely delicious. 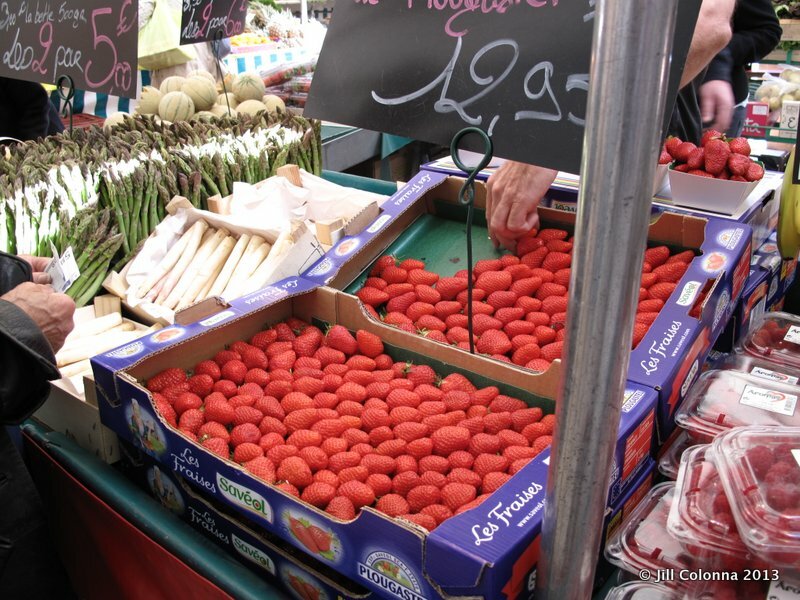 Good luck with your foodie trip to Paris this summer – it’s a great way for anyone to learn more about the City of Light and its sweet life. It will be a huge success! 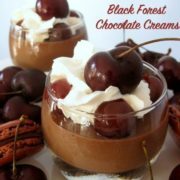 Don’t forget to check out many more recipes like this on Mardi’s blog and follow her at Eat.Live.Travel.Write. What a delightful guest post! Mardi, your raspberry curd sounds delightful and that tart is just gorgeous! How do you STAY SO THIN!!! Wow! How did I miss this one? 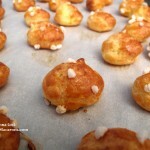 Gorgeous pictures and a great guest recipe. I´ve been having a raspberry craving all week. Roll on the summer! 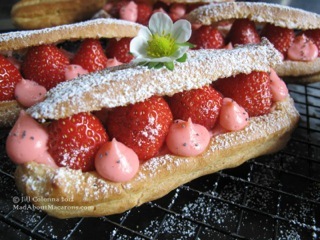 That raspberry curd sounds delicious–and those tarts are to die for! This looks delicious. Raspberry curd – how creative! Everything looks so perfect…almost heavenly delicious! Great post. Jill my dear you are so clever to get Mardi over here for Mardi Gras. I love it. It’s brilliant. I am going to be a lucky duck and get to meet Mardi in person at a conference in a few weeks. So excited. Mardi this is so gorgeous. It looks so decadent. I was going to try making a lemon curd but I think I just changed my mind. This is now bumped lemon off the list. Great photos too. Kim, I was a lucky duck that Mardi accepted to come over virtually as the queen of tarts! The tarts look delicious. Great idea to make raspberry curd. Unfortunately raspberries are very expensive in Greece, if you are lucky to find some, but I will try to make some curd with strawberries. these are beautiful! and raspberry and chocolate? always delicious! Many thanks – it’s a combo that I love, for sure! Hello Mardi, nice to meet you! I just checked your Meyer lemon macarons and my drool hasn’t stop since I looked at them. 😉 When I think of curd, it’s always lemon, but Raspberry does sound wonderful! Raspberry and chocolate are the best combination and oh these treats look so delicious! Great guest post ladies! Thanks for stopping by here and over at my blog. 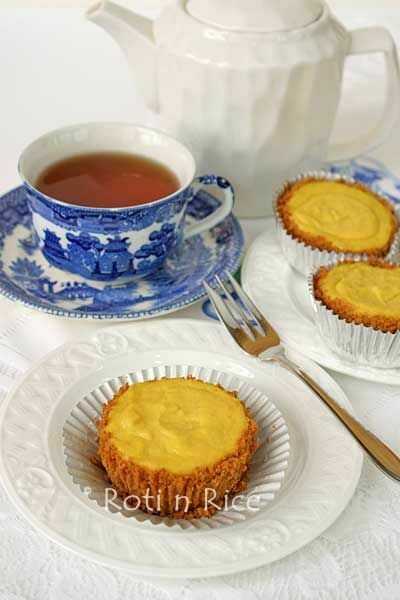 The Meyer lemon macs are some of my recent faves, for sure! Fantastic sweet treat. Expertly executed. Thanks so much – appreciate the kind words! Great guest post – Jill & Mardi! Love it! Lime curd is on my list as well to make soon! I love that you are posting on Mardi Gras. Too cute. Your little dessert looks fabulous! Thanks – well SOMEONE had to make the Mardi Gras joke, right? LOL! Oh, you two work magic together!! Love this guest post Mardi…as much as I love lemon curd, I think your raspberry curd might trump it! SO yummy with chocolate! Thanks, Jill and Mardi! Thanks Liz, I am hoping I might actually get to have the honour of baking with Jill sometime this summer! 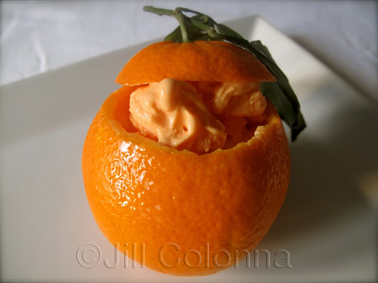 Well I am fairly new to making even citrus curds so if I can make this one, you can too! This looks wonderful. I have Dorie’s book and I believe it will become a classic like Julia Child’s Mastering the Art of French Cooking. Your creation sounds marvelous. 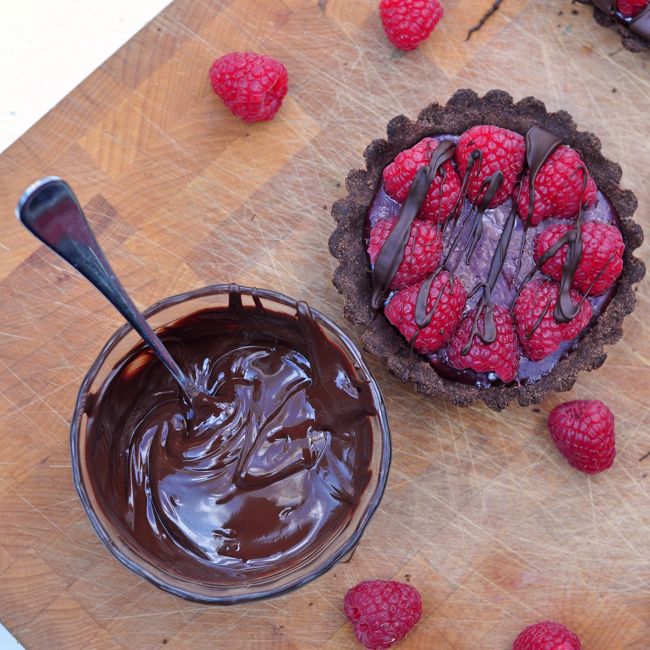 Chocolate and Raspberries are the perfect marriage. Thanks Vicki – it’s one of my favourite cookbooks for sure. Most everything works like it’s supposed to and I love the way it’s written! It’s most definitely a marriage made in heaven! I love when an experiment turns out beautifully. 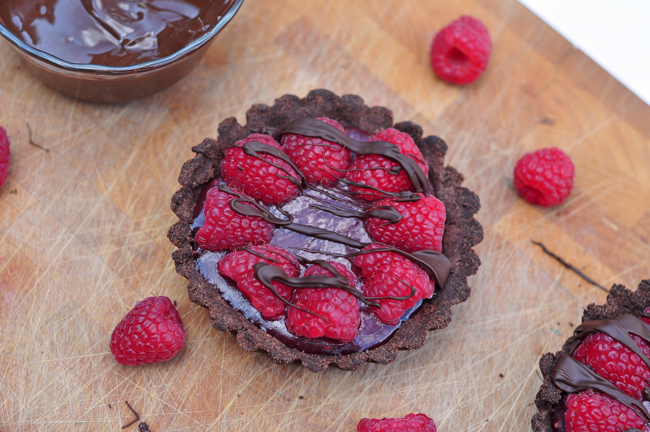 This raspberry curd was an excellent idea Mardi and served up in this chocolate tart shell just makes them irresistible! Oh, how I adore raspberries!!! I’m lucky to have a really nice man at the Farmer’s Market who always saves me two of the baskets he sells as he knows I can’t make it early! And raspberries and chocolate? Well I”m absolutely sold! I’ve never even heard of Raspberry Curd, but I’m positively certain that I will love it! Well Kim I am happy to say it was an experiment that worked out for the best 🙂 Now I have tried with raspberries, I will definitely try with some other fruits too. Wow, that looks beyond delicious! 🙂 Love the berries with the gananche! 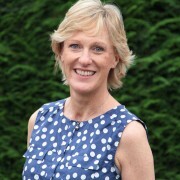 Great guest post, wonderful to see you at Jill’s blog! Oh my. I love all things raspberry. I’m so glad this is about the curd instead of the chocolate! It looks absolutely delicious. I love the fact that the curd is a bit more on the tart side. Many thanks for sharing your friend with us, Jill. That sounds and looks delicious! Happy Mardi Gras! Thanks so much for stopping by Ben! I made lemon curd this week and it was SO good. I’ve nearly used up the whole lot. Must be time for some of this raspberry curd. I’ve got some in my freezer and I can hear them calling me. this tart looks SO good. For some reason, I always thought curd was difficult to make but it’s actually really easy 🙂 I’ll be making this again with other fruits. 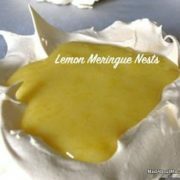 It is great to find a recipe here for curd that does not stem from a citrus fruit, very creative! The tarts do look tasty, with that rich chocolate drizzle and the fresh berries on top. 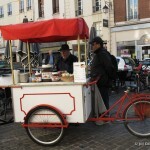 Great guest post, now I am going to pop on over to Mardi’s blog for a look, thanks for the intro! Well it was a bit of a gamble Tina but it worked out in the end! It’s not the prettiest colour – I was hoping for a deep red – but it tastes wonderful! This curd looks great and savory delicious. Well whilst it’s not super sweet, it’s not quite savoury. A nice change and works well against the rich chocolate.